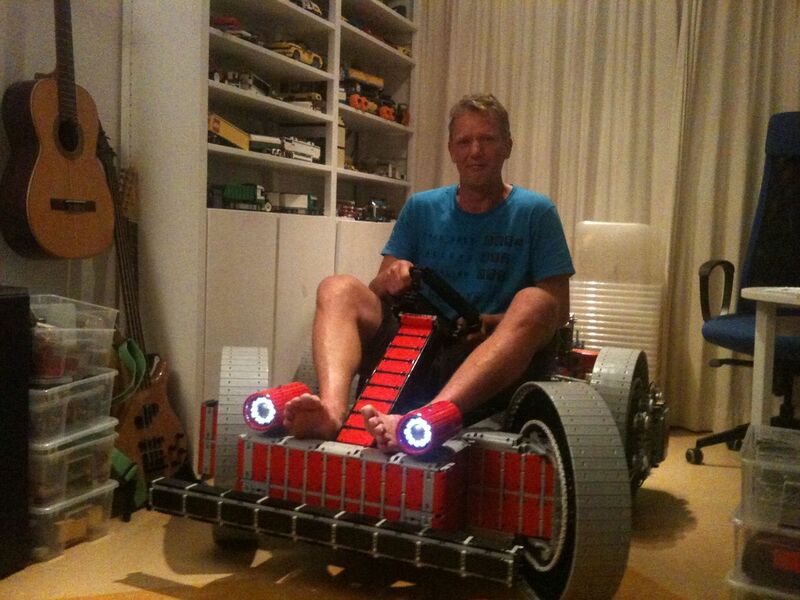 [Eric Steenstra], from the Netherlands, decided to build a GoKart entirely from LEGO Mindstorm parts. Tested at being able to carry just over 100Kg in weight, a 16 stone man(224 lbs). This GoKart can easily carry a child and propel him along. Eric used 48 stock Mindstorm motors, geared down, and 16 battery packs to provide a balance between torque and speed. This vehicle doesn’t expect to win any races in the speed department. From the point of view of being something different this wins hands down. The Karts first test drive was only two weeks ago so drivability and durability are still under development at this stage. See the video after the break on this monstrous Mindstorms creation. [cHaRlEsg] posted a rant, then posted full instruction on how to build this electric go-kart for yourself. Now the rant calls this an unobtainium-free sibling to the Chibikart. We’re sad to report that the unobtainium he’s talking about are the hyper-awesome hand-wound hub motors that powered the original kart which left us dumbstruck after seeing it for the first time. But look, few mortals have the skills and tools necessary to manufacture those circular marvels of modern engineering. So you’ll just need to settle for stuff you can buy to assemble the tiny kart seen here. It’s all-electric, using two DC motors to power the rear wheels. You can catch it racing around the hallways in the video after the break. The only thing we can see missing from the equation (other than red shells and the like) is a helmet and bumpers (you’ll see why at the end of the clip). Whoops… Looks like we covered this already. My mistake. In case the name didn’t tip you off, this fun little kart was inspired by MarioKart. The goal was to build a functional go kart that could be controlled via the Nintendo Wiimote. They did a pretty good job and kept it fairly simple too. They designed a frame that vaguely mimics the shape of the carts in the game. The steering is handled by a 4″ stroke linear actuator. This was initially hooked directly to the tie-rod, but they found it to be too slow. Their solution was to put a lever in between the two with a 1to 3 ratio. This made everything much snappier. Though they were capable of implementing PWM on the motors in their hardware, they opted to stick with full on, full off because of the push-button nature of the controller. The connection and communication are handled with an Arduino and they don’t mention what bluetooth module they use. You can see in the video below it is fairly responsive and has more than enough power to lug a passenger over some varied terrain. [Henry Herndon] is working on building an electric kart, mostly with surplus parts. He’s got some experience with electric vehicles but that doesn’t mean the build is going without a hitch. So far he’s come up with a way to make the peculiar motor shaft play nicely with his rig but once everything was put together he had trouble with the chain coming off of the cogs. We know there’s a lot of links here so far but just a couple more: [Henry] took some shots of the kart chassis before adding the motor, and just for fun, take a look at his scotch tape dispenser. When you’re done clicking on those join us after the break for some test drive footage.